pharrell | ACME Content Co. There is a relatively new niche in the hip-hop blog world focused squarely on tracking the business moves of the hip-hop elite. Instead of covering new tracks or beefs among rappers, these blogs cover endorsement deals, business ventures, and hip-hop’s other forays into the corporate world. The emergence of this type of blog/site simply illustrates that while music is at the root of it all, the hip-hop lifestyle and culture transcends far more than the airwaves, myspace and youtube. Fans, aspiring entrepreneurs and executives are finding inspiration in more than just lyrics – tracking and even obsessing over the business moves of hip-hop moguls. And that should not come as a surprise… With Jay-Z, 50, Pharrell and JD all immersing themselves in highly lucrative and innovative corporate relationships, the stratospheric rise of the hip-hop mogul is often more interesting than most hip-hop music. One of these sites in particular has clearly taken the lead in this new category: Corporate Takeover. 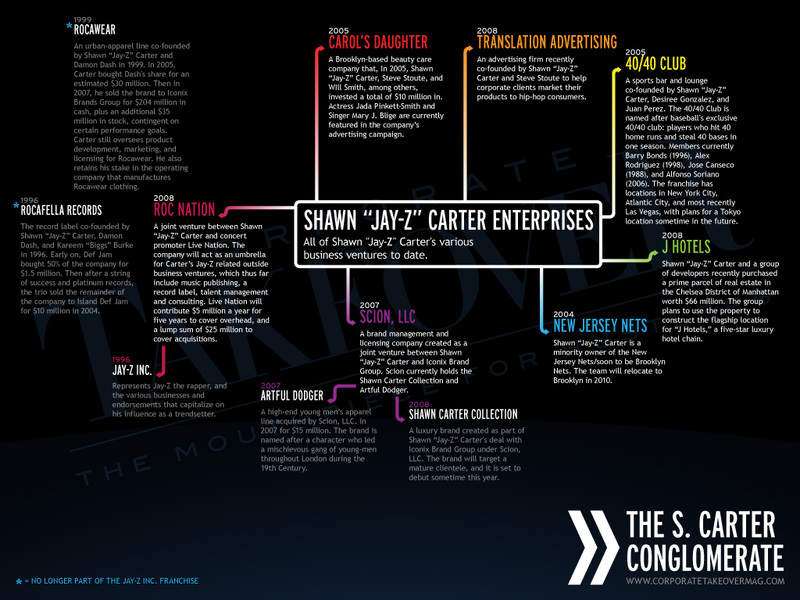 As a long time reader, I was thrilled to be asked to offer up some thoughts on Jay-Z for what turned out to be an incredibly thorough, well-crafted piece that documents The Corporate Takeover of Jay-Z. Jason ‘Jay’ Mohawk and Corporate Takeover probably just ended up on Rupert Murdoch’s radar. Keep up the good work.